This weekend was a learning experience. The bike felt great but a flat battery and a water leak hampered my weekend. I qualified 15th on Saturday morning and the bike was working great until I stopped for a practice start and the temperature was up at 105 degrees. I executed the start quickly and got back to the garages trying to keep the engine cool. I checked the water and i had lost about 250ml which is most of the radiator. I re-filled and attended race 1. 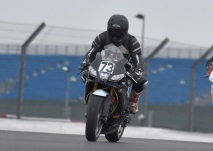 Again the bike felt great but the lack of track time meant I was being surprised most laps by new or changed bumps. I started 15th and finished 17th. Again the engine lost water, about the same amount again so I topped it back up and prepared for race 2.